Sonic the Hedgehog Spinball (also known as Sonic Spinball) is an adventure pinball game in the Sonic the Hedgehog series. It was originally released for the Sega Mega Drive/Genesis in 1993 and later ported to the Game Gear system. It was also released in 1994 on the Master System in Europe by Sega Europe (which is one of the last games made for the system and is quite hard to find), this was later released in Brazil by TecToy and in Portugal by Ecofilmes in 1995. This version is a port of the Game Gear version. Dr. Robotnik has assumed control of Mt. Mobius and turned it into a mechanical base. Utilizing energy produced by the magma flowing under the volcano, this new monstrosity (the Veg-O-Fortress) has the power to transform helpless animals into robot slaves at an astounding rate. Sonic the Hedgehog and Tails fly onto the scene, but Sonic is knocked off the wings of the airplane by a blast from the fortress. He falls into the water, but is rescued and taken to the subterranean levels of the Veg-O-Fortress. The fortress must be destroyed from the inside-out, and the only way to make that happen is to trigger an eruption in the volcano it's built on. Sonic knows this can be done by removing the Chaos Emeralds that keep the volcano stable. Robotnik, however, is also aware of the fragile relationship that exists between the Emeralds and the mountain, and he's set up an elaborate Pinball Defense System to make sure the precious jewels don't go anywhere. Sonic Spinball is essentially the logical continuation of a tradition of pinball themed levels that started with Spring Yard Zone on Sonic the Hedgehog. The game features four large pinball 'tables' - a sewer level, a geothermal power station, a robot factory, and a launchpad system. The player must guide Sonic through each of the four levels and collect all of the Chaos Emeralds, then fight Dr. Robotnik. The main difference between this game and an actual pinball game is the ability to influence the "ball" (Sonic) directly by using the D-pad. 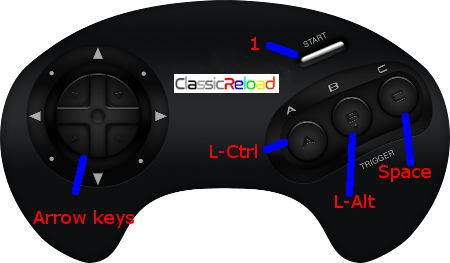 The A, B and C buttons operate the flippers and can be assigned in the Options menu. Sometimes the player can control Sonic on foot, but for the majority of the time he is rolled into a ball controlled by the flippers. The traditional Sonic the Hedgehog platformer gameplay is kept to a very low minimum.